Under the label of E-government, governments are undertaking different activities that are directly related to the development of the modern information society. 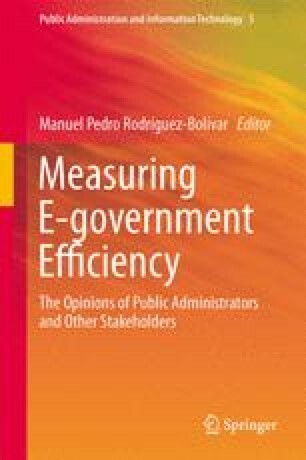 In this chapter, we will focus on a specific communicative challenge of E-government, namely, the use of social media tools by civil servants. Social media are rapidly penetrating the modern information society. This new generation of digital applications emphasizes the importance of user-participation, content-sharing, and accessible communication. Both companies and governmental agencies are exploring carefully the possibilities of social media to communicate with customers or citizens. An important reason is the assumption that the use of social media can result in governments that operate more effectively and efficiently. However, for civil servants the utilization of social media brings both challenges and risks. This chapter analyzes the challenges, risks, and dilemmas of social media for Dutch civil servants. The theoretical framework that is used consists of a “classical” and a “modern” approach to civil servants. In the classical “Weberian” model, politicians are responsible for policy making (and communication about it) and civil servants have to implement policies (“the primacy of politics”). This “principal” approach implies a limited role of civil servants in the virtual world of social media. On the other hand, the “modern” approach to civil servants highlights the professional expertise and distinctive responsibilities of civil servants. The “pragmatic” approach leaves more space for active participation of civil servants on the Internet. For this reason, a fundamental reflection about the primacy of politics, the role of governmental communication, and the culture in the new social media landscape is necessary.